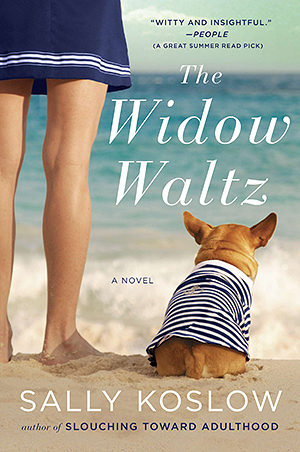 THE WIDOW WALTZ is a novel that can prompt a lively discussion. Here are some questions to kick-start the conversation. 1. When Georgia’s husband dies suddenly, she learns that he’s left their family nothing. How does she respond to this news? How would you have responded? 2. Georgia was oblivious to her husband’s secret life. What prevented her from seeing the truth? Do you think this happens to many wives? 3. The Silver-Waltz’ daughters, Nicola and Luey, are as unlike as honey and sardines. How are they different from each other and how does Georgia relate to each of them? Do you think she prefers one daughter to the other? How does the novel comment on nature versus nurture in addressing having an adopted child as well as a biological one? 4. Sally Koslow alternates perspectives throughout the novel. How does this stylistic choice affect the telling of the story? How do you imagine The Widow Waltzwould be different if it was told entirely in the third person? 5. Georgia’s relationship with her brother Stephan has always been troubled. How do her newfound circumstances change their dynamic and attitude toward one another? Do you know siblings who have grown much closer in middle age? 6. How do Georgia’s feelings about Ben evolve and shift over the course of the book? 7. How do Georgia’s feelings about her mother evolve and shift over the course of the book? 9. Georgia must eventually accept her revised reality and attempt to rebuild her life. Do you feel Georgia made the right process in this process? If faced with this challenge, how would you imagine you’d move forward? 8. After Ben’s death, Nicola and Luey must also make hard decisions about their futures, including career choices and relationships. What factors come into play that affect their choices? Do you like one sister better than the other and if so, why? 9. Not all readers may agree with the big choices Luey had to make. What advice would you have given her? 10. Georgia ultimately discovers what happened to her fortune. How would you have reacted in the same situation? 11. Consider the meaning of true forgiveness. What allows people to move on from betrayals such as the one Georgia experiences? 12. Although The Widow Waltz is in many ways a tale of loss and desperation, it is told with witty barbs. What is the role of humor in this book? Imagine how The Widow Waltz might be different without this element. © 2019 Sally Koslow. All rights reserved.